Happy New Year. Thank you all for your continued understanding and support for the activities of our Association. We are now in 2019, the last year of the Heisei era; however, the year has gotten off to an uncertain start due to the significant decline in the US stock market, which in turn has led to a major fall in stock prices in Japan in the first trading of the year and a sharp rise in the value of the yen. Up to now, the economic situation has been steadily recovering; however, I believe that concerns that confrontations between the Trump Administration and other nations over trade policy, particularly the trade friction between the US and China, will put pressure on corporate activities, and market concerns about global economic deterioration, due to geopolitical risks such as the situation in the Middle East, North Korea, and political turmoil in Europe and the United States, has intensified. Thus, the situation surrounding our association is changing globally on a daily basis, and the challenges we face today are becoming ever more complex and diverse, and in order to meet the expectations of users of analytical instruments, I believe that we need more flexible interchange between our members than ever, such as providing solutions through cooperation among members. JAIMA will mark its 60th anniversary in 2020, and I hope for us to make it through these uncertain times and make a new leap forward into a brighter future. 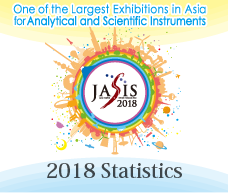 Now, JASIS is the core project of JAIMA, and at JASIS 2018, held in September last year, was a great success, almost equaling the results of the record-breaking year before in terms of the number of exhibitors (494 companies), the number of exhibitor booths (1462) and the number of visitors (23,697). This success was wholly due to the cooperation of our members, for which I am truly grateful. At JASIS, it has become increasingly important to introduce not only equipment, but also solutions. The "Open Solutions Forum – New Technology Presentations by Theme –", which started in the year I became president, has seen an increase in the number of visitors year by year, with 2,275 participants in JASIS 2018. This is a further increase of 650 participants over the year before, when the number doubled, which shows an increasing level of interest. In addition, at the "Life Science Innovation Zone", now in its sixth year, the number of exhibitor booths exceeded 100 for the first time, and I got a sense of the increasing expectations for the life sciences. In addition, we also held a Japan-US joint session entitled "The role of global drug development and bioscience" as a new initiative related to the life sciences. The JASIS WebExpo, which started in 2017 as an Internet exhibition that you can participate in from anywhere for 180 days has been well received, and in its second year, for JASIS WebExpo 2018 there were over 4,800 visitors – about 25% higher than the previous year. As a digital marketing tool that enables us to discover customers that we have not been able to capture in the past, it is growing into a project with which we can propose new sales methods to exhibitors. 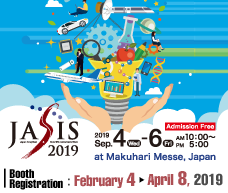 In addition, we will be holding "JASIS Kansai 2019", the first JASIS exhibition to be held in the Kansai area, at Gran Cube Osaka (Osaka International Convention Center) from February 5 to 7. At present, we have received applications for 174 booths from 92 companies, and the booths have already been sold out. In order to uncover latent demand not only in the Kansai region, but also in the whole of Western Japan, JASIS will provide newly exhibiting companies with effective PR opportunities, so we would appreciate the cooperation of all members. I would also like to express my sincere gratitude to the Ministry of Economy, Trade and Industry, the Ministry of Education, Culture, Sports, Science and Technology, and related academic societies and organizations who have lent us their ongoing cooperation. As for projects other than JASIS, we have worked on various projects such as response to the tax system for strengthening SME management, and various seminars and events such as the Life Science Innovation Seminar and Summer Science School. In addition, we have been actively expanding, with the cooperation of various members in various projects, such as by actively supporting exchange projects for globalization (exhibits at Pittcon 2018, analytica 2018 and analytica China 2018 etc., and a joint conference with Thailand’s TISTR-JAIMA, etc.). Furthermore, we have established the "Analytical Instrument Future Technical Strategy Subcommittee" to conduct surveys and research on future strategies for analytical instruments in response to research and development strategies in the fields of nanotechnology and materials, centered around technical committees and it has offered opinions on the importance of analytical instruments to MEXT's "4th R&D Strategy Review Working Group on Nanotechnology and Materials". Now, as you all know, Japan will start a new era in May this year. JAIMA will take a new step forward in May next year, as we celebrate our 60th anniversary. I sincerely hope for your continued guidance and cooperation, so that JAIMA, together with our members will carve out a new history together in the new era. In closing, I hope that 2019 will be a bright year full of hope for you all.